A bill, SB-109, which was introduced on January 31st, would adjust, to account for inflation, the limits on damages awarded in such civil lawsuits as wrongful deaths, illegally serving alcohol or noneconomic loss or injury. Colorado Chamber members, who have concerns about this bill, are encouraged to contact Loren Furman, Colorado Chamber Senior Vice President, State and Federal Relations, as soon as possible at 303.866.9642. The legislature must act to change the damage limits for civil lawsuits. This bill, however, would put an inflation adjustment for the limits on automatic pilot, and no legislative action would be required afterwards. The bill is scheduled to be heard Monday by the Senate Judiciary Committee, which convenes at 1:30 p.m. in Senate Committee Room 352. The bill has notable Democrat leadership support: Senate Majority Leader Stephen Fenberg (D-Boulder) and House Majority Leader Alec Garnett (D-Denver). A Fiscal Note for the bill has not yet been released. Economic damages refers to compensation for objectively verifiable monetary losses such as past and future medical expenses, loss of past and future earnings, loss of use of property, costs of repair or replacement, the economic value of domestic services, and loss of employment or business opportunities. Non-economic damages refers to compensation for subjective, non-monetary losses such as pain, suffering, inconvenience, emotional distress, loss of society and companionship, loss of consortium, and loss of enjoyment of life. Punitive damages refers to damages awarded for the purpose of punishment — to deter intentional or reckless behavior or actions motivated by malice. Punitive damages are neither economic nor non-economic damages, as they are not awarded to compensate any loss. On January 23rd, the Colorado Chamber’s Labor and Employment Council voted to oppose SB 85 known as the “Equal Pay for Equal Work” bill as introduced. The bill’s sponsors and proponents of the bill have expressed a willingness to work with the Colorado Chamber on the legislation to address its concerns. The bill is co-sponsored by Senators Jessie Danielson (D-Wheat Ridge) and Brittany Pettersen (D-Lakewood) in the Senate and Representative Janet Buckner (D – Aurora) in the House. The bill has been assigned to the Senate Judiciary Committee but it has not yet been scheduled for a hearing. The Colorado Chamber, having analyzed the bill, has concerns that the bill removes the state administrative process that has been in place for years that allows a worker to file a wage-discrimination complaint against an employer with the Colorado Department of Labor and Employment (CDLE). Additionally, the requires an employer to post all job openings and promotional opportunities along with the pay range. In brief, if a court finds an employer to have acted in “good faith,” the court can still award liquidated damages to the worker. Finally, the employer could be liable for “legal and equitable relief, which may include employment, reinstatement, promotion, pay increase, payment of lost wage rates and liquidated damages. . .” The employer would also be liable for the worker’s “reasonable costs, including attorney fees.” The worker would not be liable, however, for the employer’s legal and related costs if (a) the case was decided in the employer’s favor or (b) in the case of a frivolous lawsuit dismissed by the court. For more information on SB-85, contact Loren Furman, Chamber Senior Vice President for State and Federal Relations, at 303.866.9642. 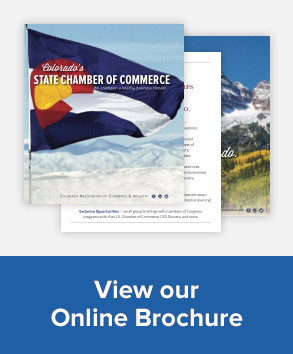 Policy Councils are at the core of the Colorado Chamber’s work and provide an opportunity for dialogue between our members, key legislators and state agency leaders. Influential guest speakers for upcoming councils are listed below. March 27th: Representative Chris Hansen, Joint Budget Committee and Chair of Appropriations Committee. Special thanks to PhRMA for sponsoring our February Federal Policy Council & lunch! Federal Policy Council dates for 2019 are here! February 19 – Get to know Congressman Crow! Want to see your logo next to these Fed Council alerts? We do too! Contact Laura Moss, LMoss@COchamber.com, (303) 866-9652 or Leah Curtsinger, Lcurtsinger@COchamber.com or (303) 866-9641 for more information about sponsorships and/or policy issues of interest for future council meetings.